-50/50 outer shell, one side tough 420 Denier Poly and the other side semi-reflective/heat resistant 266PE. -Top zip flip top opening for ease in sliding your board in and out of the bag. -Strap pocket to stow strap and accessories during travel. -Padded shoulder strap with Velcro closure system. -Padded handle for extra comfort. -Rail guard around the zipper to protect your board. 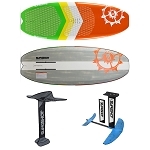 -Closeable vent to allow air flow to keep your board cool.